We are pleased to announce BC Educational Resource Acquisition Consortium has updated its agreement with Ingenuity Works to provide member districts with a discount on All the Right Type 4 Online (ATRT4) for the 2018/19 school year. We are pleased to announce BC Educational Resource Acquisition Consortium has updated its agreement with Ingenuity Works to provide member districts with a discount on All the Right Type 4 Online (ATRT4) for the 2017/18 school year. 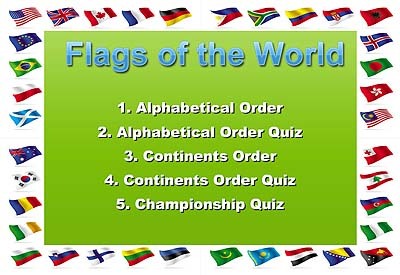 Compete against other ATRT users on your knowledge of flags around the world. Practice typing countries in different continents as you recognize the country flag. 5 different challenges. ​New Themed Game called Create Practice Text. 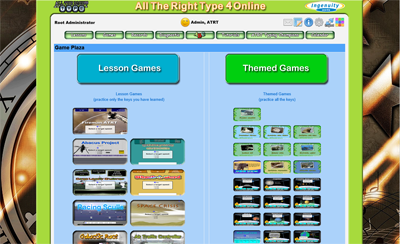 This game allows users to create their own practice lesson. You can type or copy and paste text from other sources. Users can compose their own stories and save to use as their practice warm up lesson. We have now added a search for looking up students by last name or first name in your school. The search is available under the maintenance tab and then display users. Students can now customize the look of their homepage. This option is managed by the teacher and can be turned off or on when setting up or editing a class. Once a teacher checks off the "theme button" , the next time a student logs in they will have this feature. 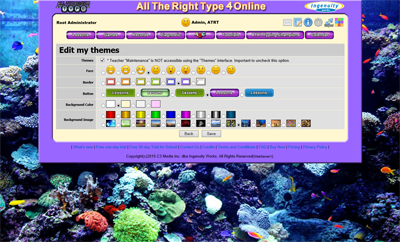 If the theme button is unchecked, the classic campus view is the home page. Theme pages are not recommended for the teacher home page because it does not have a maintenance tab for you to manage students.